For its $3545 surcharge, the F Sport Package adds a sport-tuned suspension, staggered-width (wider in back than in front) 18-inch performance tires on specific alloy wheels, and several trim and equipment enhancements. 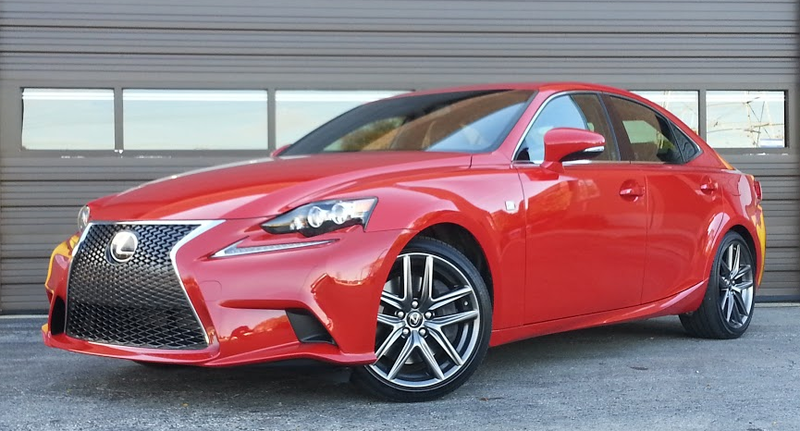 If you’re in the market for a luxury compact and are thinking of dropping by the local Lexus dealership for a test drive of the IS sedan, you’ll find there’s a little more zip to the trip. That’s because for 2016, the base IS is newly powered by a turbocharged 4-cylinder engine that’s more powerful than the small V6 it replaces. Lexus has picked up the 2.0-liter turbo mill first seen in the new-for-2015 NX compact crossover SUV and plopped it into the brand’s entry-level sedan, creating the IS 200t. 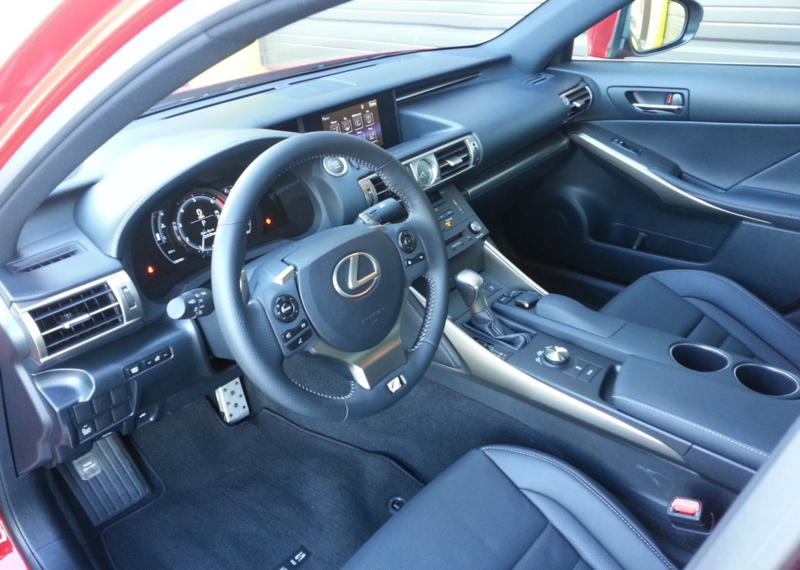 Consumer Guide® editors got the chance to drive the racier F Sport version. Regardless of which 200t model it’s in, the engine makes 241 hp at 5800 rpm and 258 lb-ft of torque beginning at 1650 revs. That’s a few more horsepower than it develops in the NX (torque stays the same, though)—and substantially more than the 204 ponies of the 2.5-liter V6 that motivated the discontinued IS 250. Offered only with rear-wheel drive, both 200t models pack an 8-speed automatic transmission with paddle shifters and console-mounted Drive Mode Select that modifies engine performance and throttle response. “ECO” and “Normal” modes are common to both IS 200t sedans, but the “Sport” level in the F Sport version is further split into “Sport S” and “Sport S+” designed to deliver snappier gear changes. Normal mode lives up to its name for everyday commuting with nice but not noteworthy acceleration and a hint of turbo lag. However, throttle response certainly feels somewhat sharper with Sport S mode dialed in. Transmission shifts are indeed crisper, too. Lexus cites a 0-60-mph time of 6.9 seconds and an electronically limited top speed of 143 mph for the 200t. The turbo four also holds out the promise of better fuel economy than the IS 250 could attain. ECO mode tamps down the throttle response and power output but the 200t’s dohc engine also slips into Atkinson-cycle operation under reduced load, which alters intake-valve operation for better fuel efficiency. EPA estimates for the IS 200t are 22 mpg in the city, 33 mpg on the highway, and 26 mpg combined. This tester attained 22.54 mpg in the wake of a 107.8-mile trip, 72 percent of which was in city-type driving. While not outstanding, that compares favorably to the 21.18 mpg that he saw from an all-wheel-drive 2014 IS 250 F Sport in a stint of similar distance but with only 51 percent city driving. The cabin is subdued in appearance but sporty in nature, with clingy front seats, metal highlights, and aluminum pedals. The IS 200t F Sport starts at $40,870, which is a jump of $3545 over the base 200t. Across-the-board standard equipment encompasses items like dual chrome exhaust outlets, power moonroof, heated exterior mirrors with integrated turn signals, Enform mobile app for remote monitoring and operation of some systems, Bluetooth connectivity, voice-activated controls, real-time traffic info, 8-speaker stereo, satellite radio, leather-trimmed tilt/telescoping steering wheel, power-adjustable front seats, automatic dual-zone climate control, full-color LCD multi-information display within the gauge cluster, and illuminated entry. To that the F Sport adds a distinctly tuned suspension, staggered-width performance tires on 18-inch alloy wheels, specific grille and front-bumper design, heated and ventilated front seats, aluminum pedals, backup camera, LED headlamps, and G-force and turbo-boost displays added to the vehicle-information display. If you’ve got the cash and the will to spend it, there are plenty of things available to tailor the IS 200t to your taste. Among the options are a navigation/stereo-upgrade package, DVD entertainment system, rear-window sunshade, adaptive cruise control, blind-spot monitor with rear cross-traffic alert, console-mounted Remote Touch Interface (RTI) controller, and an infotainment-system app suite. 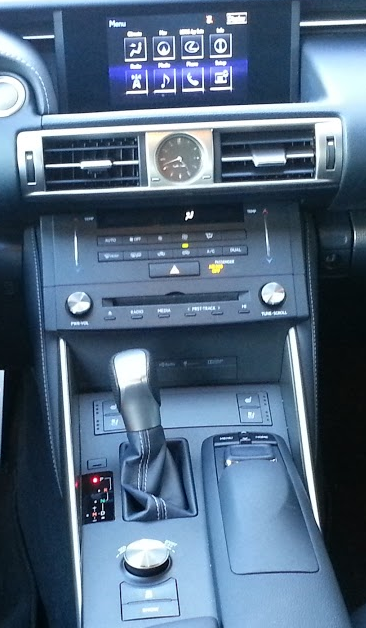 As with many Lexus vehicles, the IS includes a console “mouse” controller (rectangular button at bottom right) to make infotainment adjustments, but most can also be made through the touchscreen. The F Sport suspension delivers a great balance of ride comfort with driver control in the IS 200t. Though its powerteam is new, the car’s fundamental packaging and interior ambience are unchanged from ISes that CG has tested in the last couple years. Things can be a little tight when sliding behind the wheel. Head and leg room are OK in front, but less so in back, and rear-seat entry and exit takes some doing. The deeply sculpted backs of the front seats give rear passengers as much precious knee room as possible. 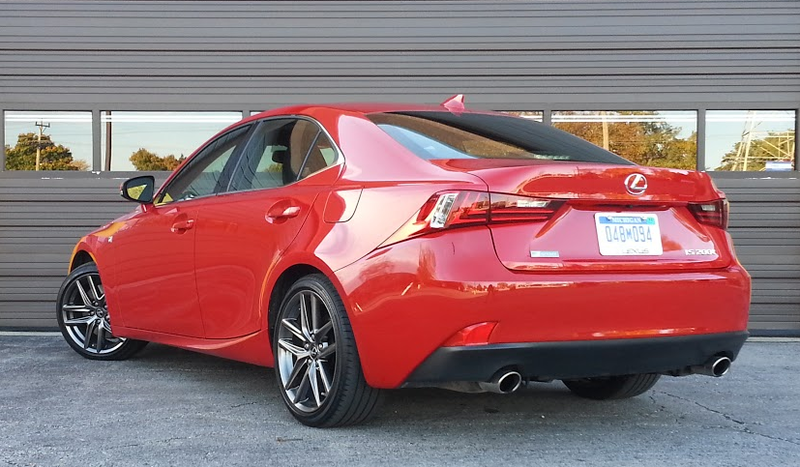 Lexus says the IS is a 5-passenger car; the huge driveline hump says 4 passengers. Heed the driveline hump—it’s staying put right where it is. Comfortable sport seats are appropriately bolstered for a car with sporting attitude. The quiet cabin is sprinkled with metal highlights here and there for a bit of tonal variety but some déclassé plain black plastic on the forward part of console is hard to ignore. Control buttons—quite a few of them—for climate and audio settings are within easy reach of those who want to avoid using the RTI mouse whenever possible. (Count this driver among them.) The thin-film transistor vehicle-info display between the main gauges shows up well. 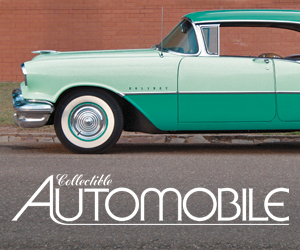 Interior storage spaces remain fairly limited. Front doors sprout small pockets, and there’s a small covered space under the narrow console arm rest. To make room for the RTI controller, cup holders reside far back on the console. The glove box is just adequate. Rear doors lack pockets, but there are pouches on the backs of the front seats. Rear cup holders spring from the front of the pull-down center arm rest. Meanwhile, trunk space is good for a car of this size. It’s easy to access through the low, wide opening, too. Rear 60/40-split seats fold for additional cargo space—though while they fold nearly flat, they do so at a point considerably above the level of the trunk floor. In all, the pairing of Lexus’s turbocharged 2.0-liter 4-cylinder and the IS platform is a natural. We’re glad that the IS now comes with a base engine that better matches its sporty character. Written by: Rick Cotta on December 29, 2015.on January 30, 2018.